Citadel of Baturin Fortress also had a historical name "Lithuanian Castle" and in the description of 1654 when Baturin got Magdeburg law the city called "gentlemen yard". Citadel of Baturin Fortress had a small area and was surrounded by wooden-earthen fortifications which consisted of a shaft pit and the oak stockade. Entrance to Citadel of Baturin Fortress were two gate towers and besides them towered six more towers at corners. Only from the side of Seym River was not a pit and shaft because there were impregnable natural slopes. During the reign of Hetman Ivan Mazepa Baturin reached its greatest prosperity. This time Citadel of Baturin Fortress occupied an area of almost 20 hectares, had a powerful defense shaft and palisade. Citadel of Baturin Fortress was one of the largest in Ukraine. In 1708 Hetman Ivan Mazepa made the decision to join to Swedish King Charles XII. When Russian Tsar Peter The Great received the news about the betrayal of Hetman Ivan Mazepa he decided to destroy the capital of Hetman - Baturin and ordered to make it to marshal Alexander Menshikov with army. The army of marshal Alexander Menshikov cuptured Baturin and killed all the cossacks as well as civilians - men, women and children. They also looted and burned Baturin with churches and monasteries. In official documents the event is called "Baturin Tragedy". After "Baturin Tragedy" Alexander Menshikov got Baturin as a gift from Empress Catherine I and the Residence of Hetmans was moved to Glukhov. Only in the middle of the eighteenth century in 1750-1764 by the efforts of the last Hetman of Ukraine Kirill Razumovsky Hetman Residence back to Baturin and the city began to revive. Citadel of Baturin Fortress was reproduced in 2008 on the place of historic fortress on the left bank of Seym River as the part of "Hetman Capital Reserve". 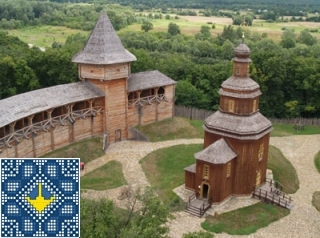 Design team of Institute "UkrRestoration" developed the concept of architectural plan, landscaping and the complex of monuments of Citadel of Baturin Fortress on the basis of long-term archaeological research and deep study of historical sources in the defense architecture of Ukraine in seventeenth and eighteenth centuries. In 2008 (from March to November) in Citadel of Baturin Fortress built eleven objects: Entrance Tower, North Fortress Tower, South Fortress Tower, defensive wall, Hetman House, wooden Resurrection Church, Treasury, well, moat and Fortress Bridge. From the top of Entrance Tower of Citadel of Baturin Fortress opens beautiful view to Seym River and surrounding landscapes.